I’m back at it with another one skillet dinner! 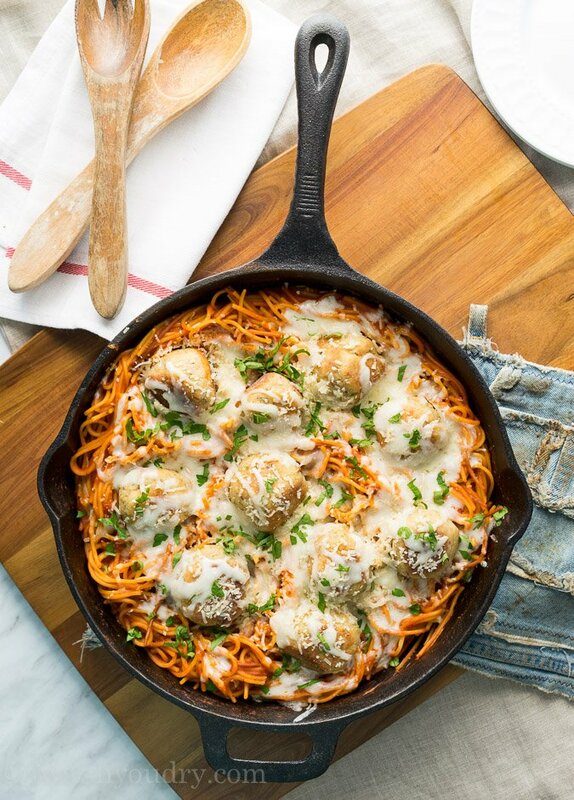 This Chicken Parmesan Meatball Skillet is so delicious, you’ll never make spaghetti and meatballs the old fashion way again! So a few years ago I made this Mexican Spaghetti (and it is seriously still one of my favorites). 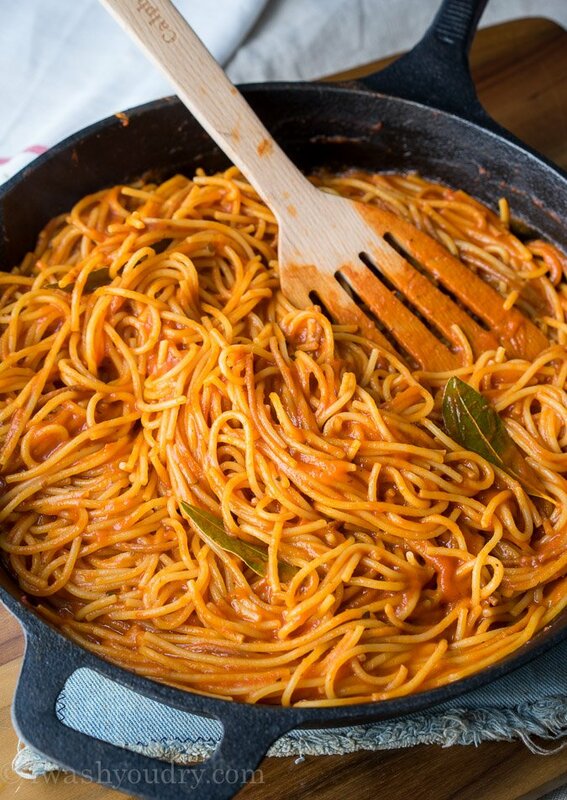 One thing I truly love about it was how I cook the spaghetti noodles straight in the pan, with the sauces. 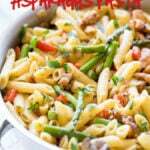 The pasta absorbs the sauce and the flavors are just that much more amazing! I did the same thing for a Mediterranean inspired pasta dish in my cookbook, and here again for this classic Italian dish with a twist. 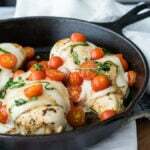 They’re a moist and flavorful chicken meatball that you sear in the skillet and finish off in the oven. Super easy! 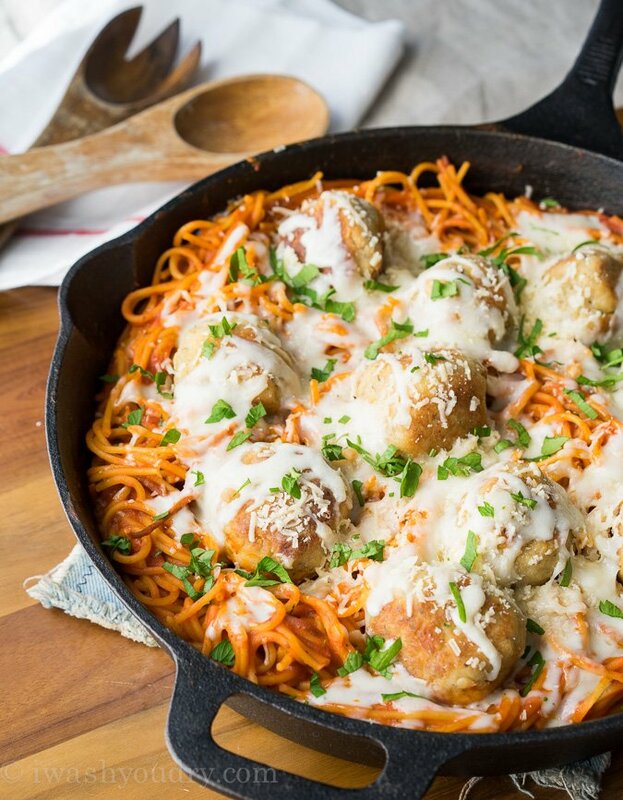 Remove the chicken meatballs from the skillet and then start the pasta! I like to lightly toast the pasta before adding the sauce, chicken broth and bay leaves. For this recipe I just used a simple jarred marinara sauce. Now that the pasta is tender and saucy, just remove the bay leaves and add the meatballs back in! This photo reminds me of my chicken’s eggs in their nest! haha! 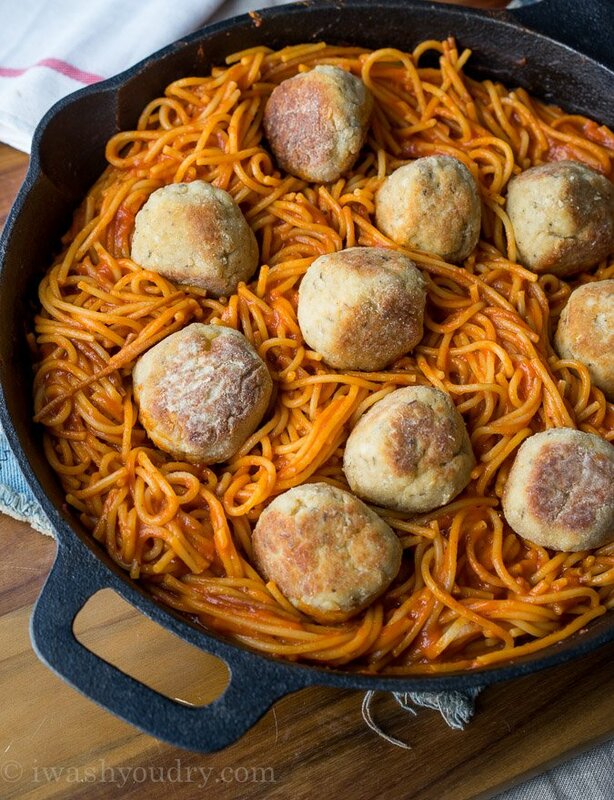 Nestle those meatballs right into the pasta! 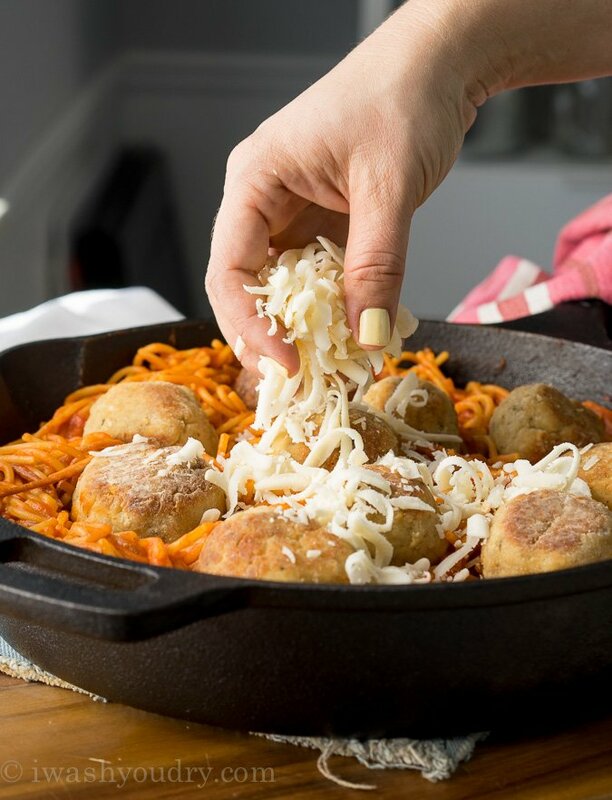 Of course we need to top our meatballs with some cheese! You could either sprinkle a little chopped parsley or basil on top. I went with parsley! 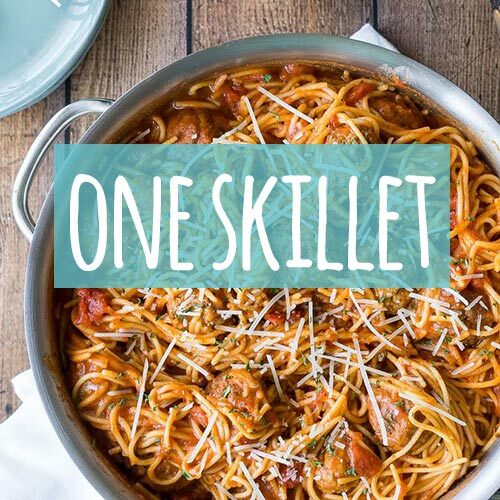 Your whole family is going to fall in love with this super easy skillet meal, and you’re going to fall in love with the fact that you only have one dish to clean! That’s what I like to call a win-win! 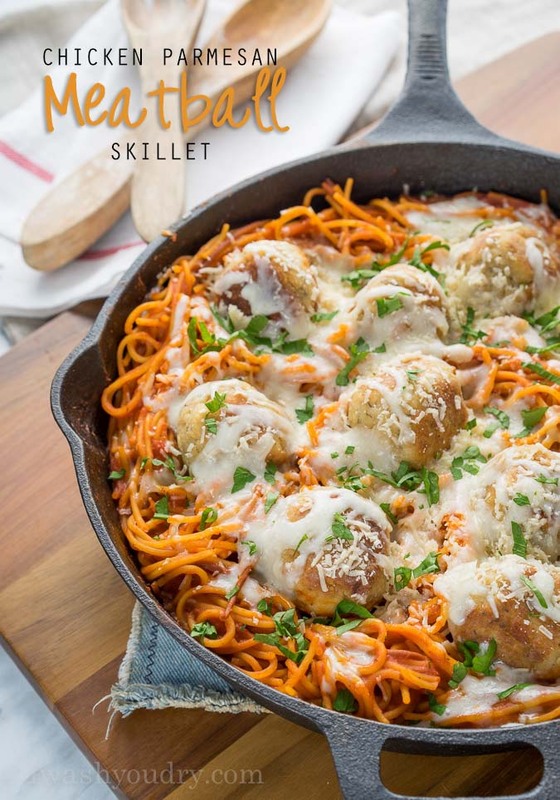 Chicken Parmesan Meatball Skillet is a one skillet dinner that has all the classic favorites! Combine the ground chicken, egg, Italian seasoning, garlic powder, onion powder, bread crumbs, 1/4 cup grated parmesan cheese and salt and pepper in a large bowl and mix until combined. Form mixture into several meatballs, then place the flour in a shallow bowl and lightly dredge (coat) the meatballs on all sides. Heat a large, oven safe skillet, over medium heat and add the olive oil. Sear the chicken meatballs on all sides, until browned all over, then place the whole skillet into the preheated oven to finish cooking off the meatballs. 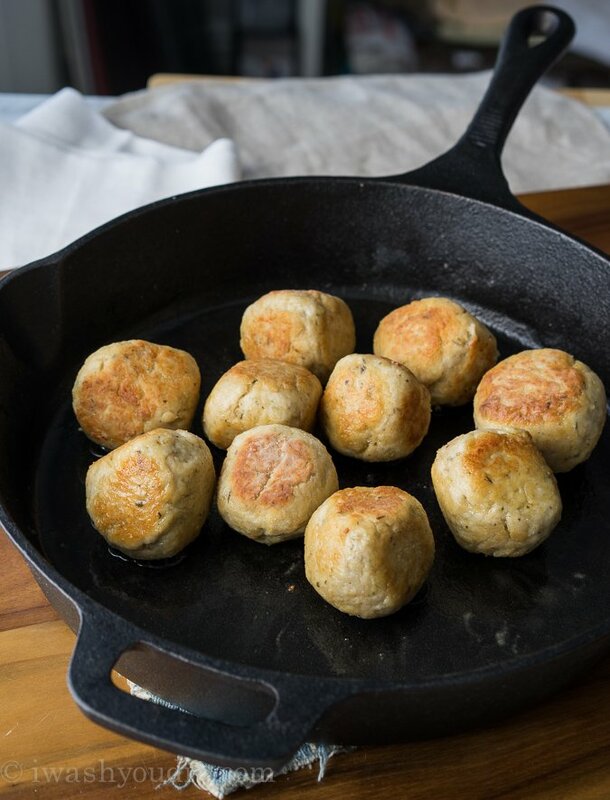 Bake for 10 minutes, or until the insides of the meatballs reach 165 degrees F. Remove meatballs from skillet and keep warm. 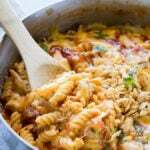 Return skillet to the stove top over medium heat and add the broken pasta noodles, stirring constantly, so the noodles get lightly toasted. Add the pasta sauce, chicken broth (or water) and the bay leaves. Bring the mixture to a boil, then reduce heat and simmer, stirring occasionally until the pasta is tender, about 20 minutes. 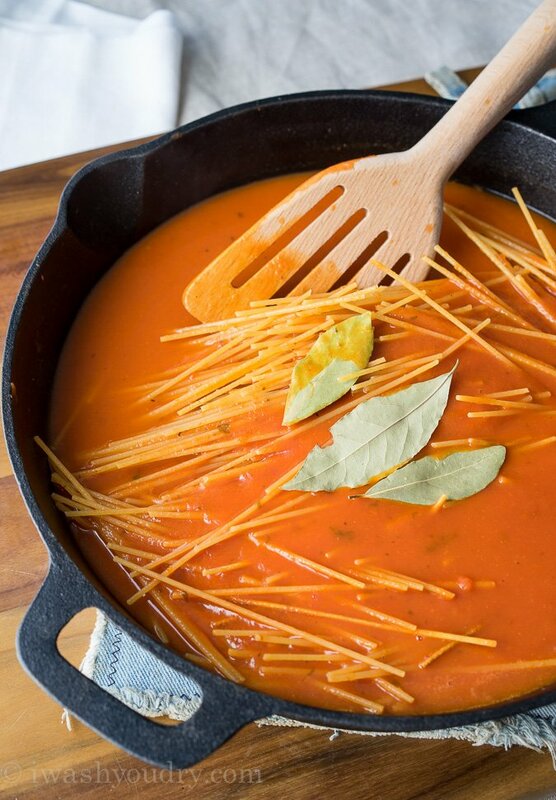 Garnish the top of the skillet dinner with the remaining grated parmesan cheese and freshly chopped parsley. Enjoy! 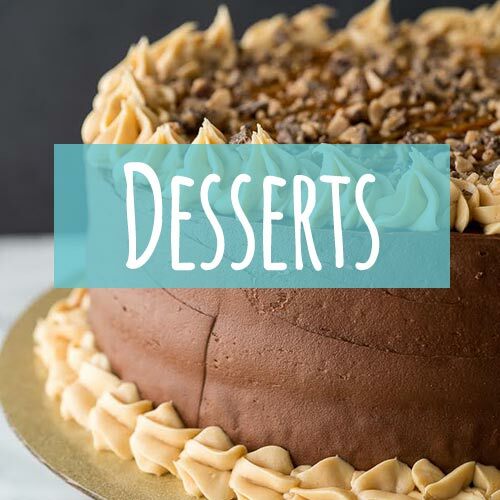 Oooooo YUM! 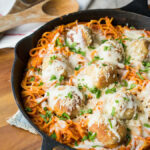 I love the idea of chicken meatballs and the chicken parm twist! 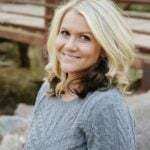 It’s spaghetti and meatballs – amped up a bit! !